Download and play an evolving collection of EA titles for Xbox One at any time in TheVault with this 12-month membership access pass. Play upcoming games before their release date, and keep your progress if you decide to purchase the game. Play EA’s best Xbox One games and top franchises, with more titles being added all the time. EA Access members can save 10% on all EA digital purchases on Xbox One. Is this worth getting for an 8 year old if they already have the games pass. Is this worth getting for an 8 year old if they already have the games …Is this worth getting for an 8 year old if they already have the games pass. Yeah unravel 1 and 2 and the sport titles are available, kids get bored very quickly so both the game pass and EA access are ideal. Yeah unravel 1 and 2 and the sport titles are available, kids get bored …Yeah unravel 1 and 2 and the sport titles are available, kids get bored very quickly so both the game pass and EA access are ideal. Yeah I got two codes from the £17.99 deal in December and added 2 years. Nice. I was unsure whether this stacks so I’ll add an extra year. Is Xbox live required to play this? Any news when FIFA 19 or Battlefield V will get fully added? Googled but didn’t see anything. You can use xbox credit now to buy ea access. So can be bought cheaper that way. Or convert microsoft reward points to xbox credit making it even lighter on the wallet. Any news when FIFA 19 or Battlefield V will get fully added? Googled but …Any news when FIFA 19 or Battlefield V will get fully added? Googled but didn’t see anything. Usually 12 months-ish after release. Fifa used to be added in April but was much later this year (think it was July/August). Have no idea when Battlefield games are usually added. Fifa used to be added in April but was much later this year (think it was …Fifa used to be added in April but was much later this year (think it was July/August). Have no idea when Battlefield games are usually added. Battlefield 1 only took 10 months so that would make it September 2019 for Battlefield V if it goes the same way. Excellent price. This is what xbox game pass should be. I'm putting down the PS4 for a while and plugging in the xbox one again. I'm a bit out of touch. Do I need xbox live Gold to have EA access? wanting really to play the campaigns of games.eg Star Wars Battlefront. Not multiplayer online. Thanks in advance. ‌ Anyone played the campaign for this? I'm putting down the PS4 for a while and plugging in the xbox one again. …I'm putting down the PS4 for a while and plugging in the xbox one again. I'm a bit out of touch. 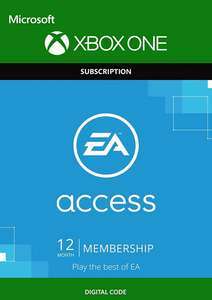 Do I need xbox live Gold to have EA access? wanting really to play the campaigns of games.eg Star Wars Battlefront. Not multiplayer online.Thanks in advance. ‌ Anyone played the campaign for this? I played the campaign on Battlefront 2 as I don't believe there is one for 1 and it was pretty good. Good story and fairly lengthy too. I played the campaign on Battlefront 2 as I don't believe there is one for …I played the campaign on Battlefront 2 as I don't believe there is one for 1 and it was pretty good. Good story and fairly lengthy too. Just Played this yesterday. It's pretty fun which was exactly what I was after. was that not becvause of the World cup update they added though. Just went through the catalogue of games and noticed a large percentage of sports games, as a person that isn't interested in Madden NBA and FIFA including the multitude of yearly reincarnations of those games... it's not really worth my while. Just way to much sport filler for someone that isn't into watching sport. Just Played this yesterday. It's pretty fun which was exactly what I was …Just Played this yesterday. It's pretty fun which was exactly what I was after. Playing this today and yesterday! Pretty good campaign!!!!! well worth the months worth of EA access to play. 21 Xbox one games, that's minus all the sports games and the backward …21 Xbox one games, that's minus all the sports games and the backward compatible 360 games..that also includes the peggles and the plants Vs zombies games, if you take them out your somewhere in the teens. Not worth it.